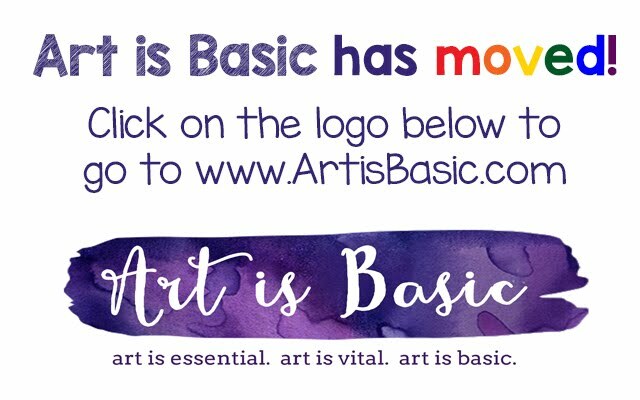 Art is Basic has moved! 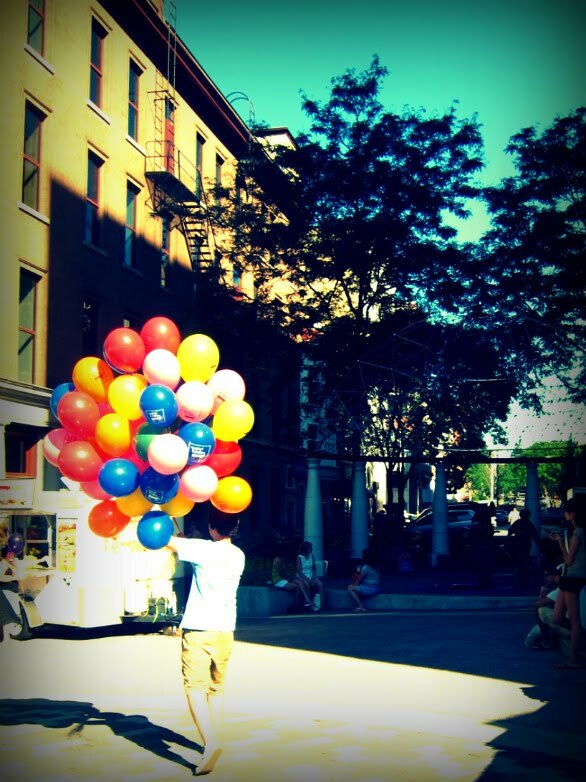 Visit my new blog location by clicking on the Art is Basic logo. These are my examples above. I think I'm going to paint them and make an assemblage out of them. I made this little guy and put him in a bowl to support his back. One of the kids said he looks like he is sitting in a hot tub! cute! We made clay people today in Clay Camp! 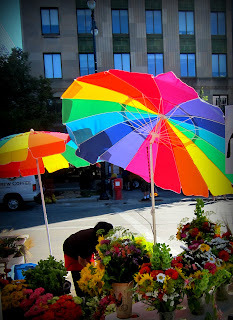 This photograph I took at the Farmer's Market in Madison. This wagon was just sitting there unattended while the owner went to go purchase some more vegetables. 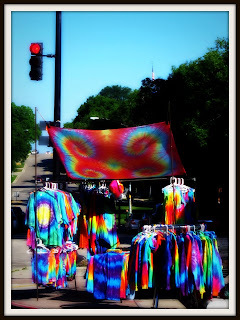 It just is a nice symbol of Madison. Here are some of the things we have been working on during clay camp for kids. The kids are going into kindergarten-6th grade. Week 3 I taught the little ones (entering K-3) how to make pinch pots for birds' nests and then how to form a bird. All of our projects will be painted next week. This is a good project for learning how to make pinch pots. First make a pinch pot with a couple of eggs in it. Next, make a bird from the leftover clay. You can leave the bird unattached, so you are able to take the bird out of the nest or place it inside. After the clay is fired and painted, you can gather small twigs and grasses to place in the nest. These birds were made by lower elementary students. I purchased Carla Sonheim's drawing book, because I'm always interested in looking at new drawing books or new mixed media art books and this is a combination of both. She has a lot of drawing exercises on her blog also. 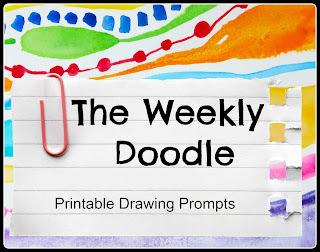 As an art teacher who avidly researches all sorts of art lesson plans, I have seen some of these drawing exercises before, but Carla puts her own unique spin on everything. I really like how the book is laid out, with plenty of beautiful examples. This will be a nice addition to my classroom library. Some other things I like about her techniques are how she blocks in her images with gesso, and then adds watercolor or charcoal or other paints on top. That was my hesitation with drawing directly on collaged imagery and getting the colors to show through. Duh! Gesso! I should have thought of that. 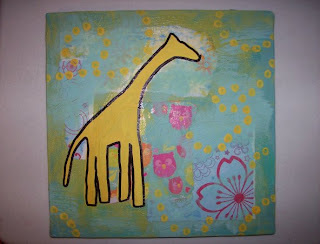 :) I use gesso already in my paintings/collages so I'm surprised I didn't think to block in my drawings with it. I actually didn't think that watercolor would work nicely on top of gesso, but it's not too bad! 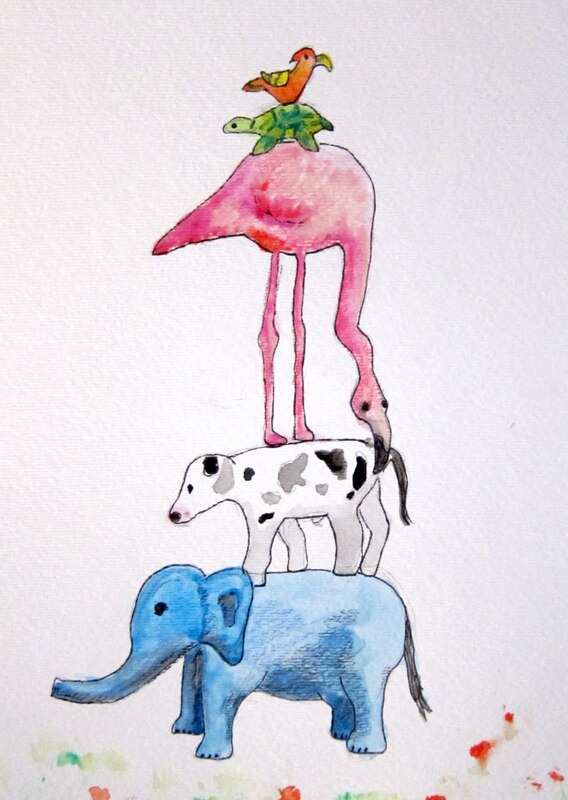 I like Carla's whimsical creature drawings--- they are delightful. One of the exercises has to do with making creatures. Here are two of my creatures. Here is a really fun and addicting way to weave... on plastic drinking straws! There's no reason to re-write all the directions out, so here is a link to how to weave on straws. If you get stuck, there are plenty of websites with full directions and even videos... simply google "weaving on straws." With this project, I set up the straws ahead of time for the kids. (There were only about 6 or 7 kids there that day.) Kids in grades 3 and up could probably set up the straws themselves. For the youngest kids (kindergarten/ 1st grade) I started them on only 2 or 3 straws and increased the straws with a following weaving. This was a complicated weaving for the kids to get the hang of, but once they started, they were addicted and several kids made multiple weavings. 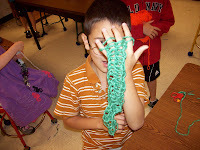 Some of the kids tried finger weaving or finger knitting. It was too hard for the youngest kids to figure out, but 3rd grade seems about the right age to start. 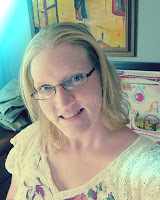 Detailed directions are here: Knitty, which is a really cool knitting blog if you are a knitter. We are having a great time at the summer Clay Camp for kids that I taught in DeForest, WI. The second week we made clay monsters. To make a monster, first, start by making a pinch pot. See this website for a demo of pinch pots if you are not sure how. Next, gently squish the pinch pot so it is slightly flattened. Turn the pinch pot on its side and add teeth, eyes, legs, feet, horns, ears, nose, tongue or whatever you want! 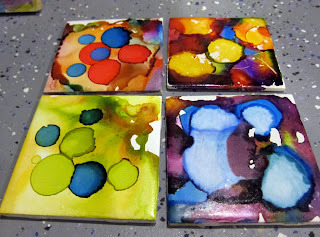 The final step is to paint these, which we will do at the end of the class. Paper Weaving. One of the projects I did with the kids for my Weaving Wonders Camp was Paper Weaving. Paper weaving is, of course, one of the first and most basic types of weaving. Kids in kindergarten, first or second grade will often complete paper weavings as introduction to weaving. Preparation: Gather fancy scrapbook paper, with patterns, bright colors and maybe even glitter. Add some solid colors if you wish. Cut strips on a paper cutter, approximately 1/2-1 inch thick. Don't be too obsessive about making them exactly the same size, you'll go crazy. Starting to Weave: Line up all of your strips on the table, making sure there are no overlapping edges. Take a long piece of masking tape and tape the strips down at the top edge. These kids, kindergarten-4th grade, finished the project in about 30 minutes. If you are worried your kids won't finish before the class ends, then have them tape the strips to a piece of cardboard so you can pack them up at the end of class. Weaving: Just like in any other paper weaving, take a strip and weave over and under each of the taped strips. The following strip will need to be woven the opposite way, under-- then over. To finish: Trim the edges, glue down all the ends on all four sides. Gently remove the tape. Cut a piece of poster board slightly bigger than the finished weaving. Apply hotglue on the back of the weaving and mount it to the poster board to finish the work. When I taught middle school art, one of the sketchbook assignments I had the kids complete was a page of doodling. They looked very much these. Bohemian Shadows blog gives a nice tutorial for this type of doodling. There are also books and workshops with the name "Zentangles" (not by Bohemian Shadows).. they coined the name which is basically just a glorified name for doodling. Anyways.... I think this year I will print out some examples for my elementary students for them to work on when they are finished with a main project. It would be cool for them to make these as an ongoing project.. maybe a book of sorts or a large fold-out artwork? July 10 is my husband's birthday.. 7/2010 is also when I made this collage... don't you see? so many layers to the numbers... amazingly enough, my daughter's birthday is 10/7. Easy to remember, which is great because I am terrible with dates. A beautiful tie dye stand at the Farmer's Market. This summer I have also been teaching a clay class for kids through the DeForest parks and recreation dept. It is only 6 sessions, one hour each session. I have 2 groups of kids: K-3, then 4-7 (roughly, there are some overlaps). Some of the weeks I am teaching the same projects and other weeks we are doing different projects. The first week we made leaf dishes. They are very simple and a good way to teach about rolling slabs. First, you roll out a slab of clay, then place a leaf onto the clay. Roll over it with a rolling pin to make an impression. Then trace around it with a knife and cut out the clay leaf. Peel the leaf off and you can use a toothpick to make deeper indentations. You can leave it how it is and poke a hole in it for an ornament, or layer more leaves to make a clay leaf collage. What we did is gently placed them into a paper bowl to make a rounded shape for a dish. Final step is to paint them! 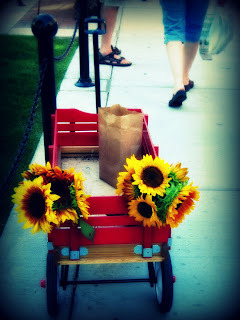 I LOVE the Farmers Market in Madison. So much prettiness and delicious vegetables. Here is a photo I took today! Circular Weaving is another one of my favorite ways to teach weaving. We did these circular weavings at my Weaving Wonders camp. Beesybee Fiber's has an explanation as to how it's done. Obviously, this link shows a very advanced form of this weaving. What we did was to take these mini-pizza cardboard circles and cut an uneven number of slits in them. Then we set up the loom by poking the yarn through the center and then each attach to each of the slits. Kids who are older than grade 2 could probably set up the loom themselves. The example below is by a child who just finished kindergarten. I like how they look when they are left on the loom. Weaving is tiring for little hands and so since we were running short on time, she finished the weaving by poking in feathers and those silk flowers from an old lei. Magnificent! 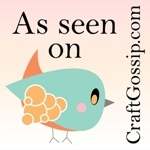 Using a variety of textures, beads and feathers, these projects could be amazing! What to do with all those family photos? Want to make a special gift for a holiday or occasion? These family photo collages are so fun to make. 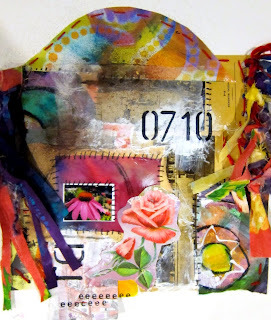 Using scrapbook paper, ribbons, photos and other bits and pieces of ephemera, make a montage incorporating a family photo or two. Add paint on top to tie the whole piece together. Too bad for the glare.. 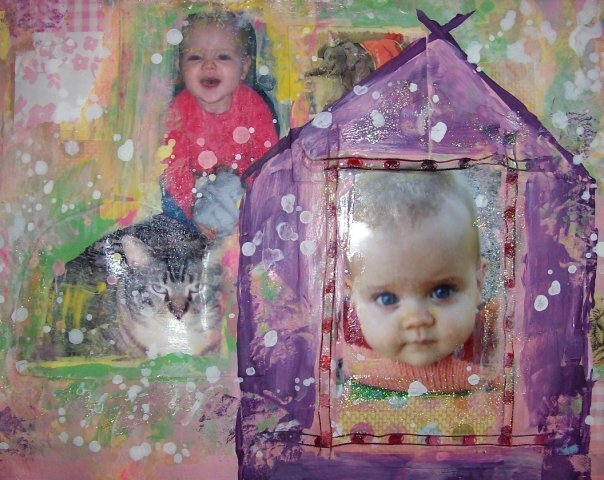 This is a photo collage I made for my niece. Sonia, 2008 My other niece, Sonia. Here are a couple of my new collages. I found the supports for these at a hardware "Re-store" near our house. They are collaged on old shelving boards. 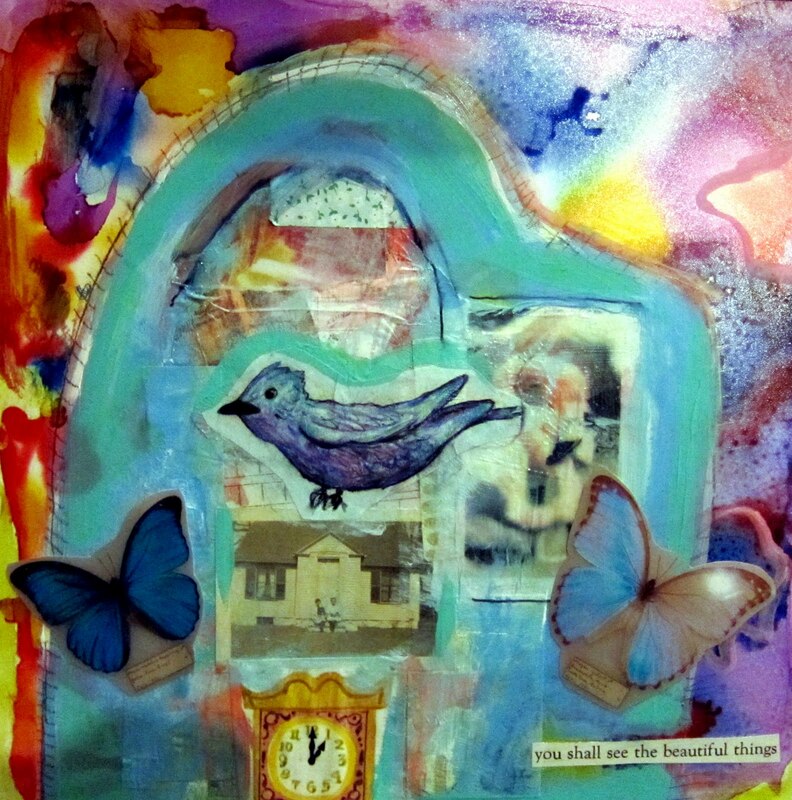 Everything is layered, painted, collaged and photographs added. I like to share my artwork, because I know not every artwork is going to be top-notch. Making art, playing with materials and trying out new ideas is important in your artistic journey. Sharing the "exercises" with other people allows me to gain momentum and become more excited about making more art. 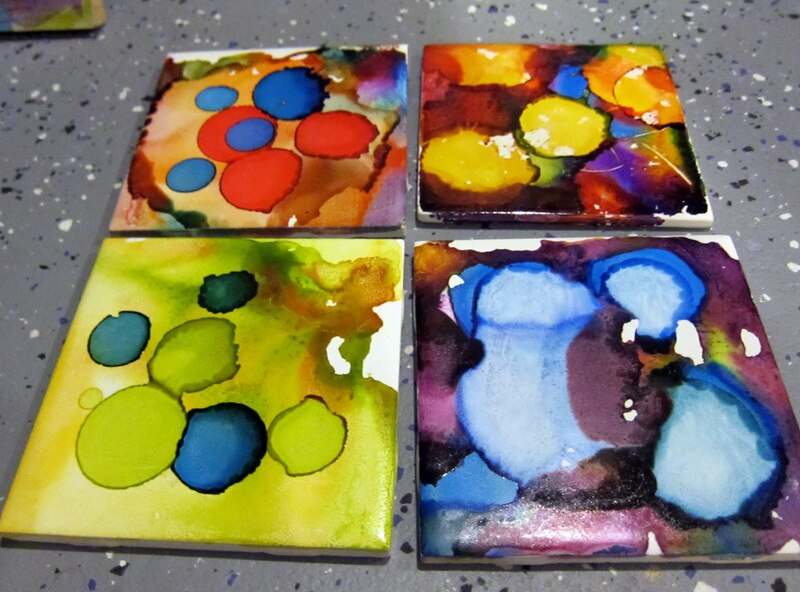 Here are some tiles I painted.. bought them for I think 5 or 10 cents each at the Re-Store. I'm trying to decide what to do with them. I will probably mount them all on a large board with a frame. I have about 20 more tiles to paint. My newest "layered" artwork is a stack of animals. I recently purchased some gouache, just some cheapo set to test it out. I really like how you can get a watercolor effect or a thicker paint application. 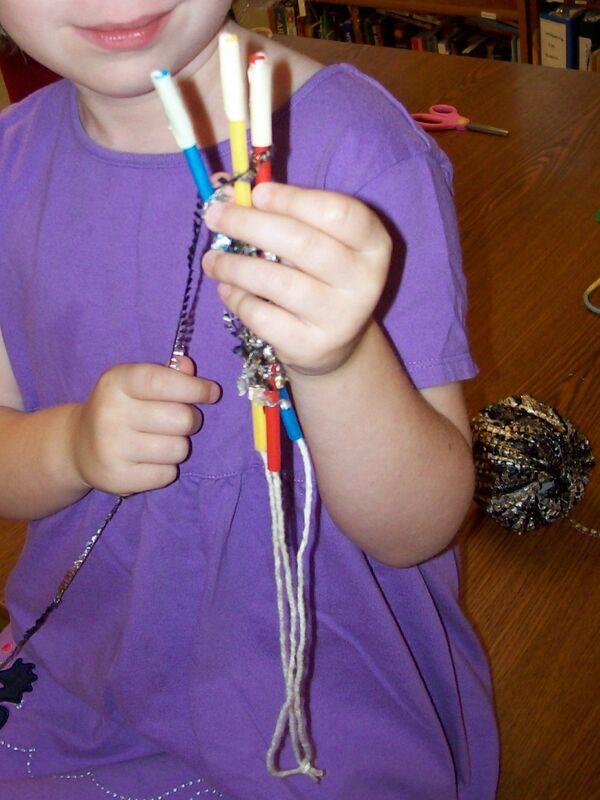 At the beginning of this summer, I taught a "Weaving Wonders" camp at my school. Kids entering grades K-4 could sign up. The camp took place from 10-12:30 each day. A different weaving technique was taught each day. Campers could sign up for any of the days or the entire week. Weaving on Styrofoam was one of the projects. A restaurant supply store near our school had a huge package of styrofoam plates for very cheap. Slits were cut at the top and bottom of the styrofoam and string was placed in these slits for the loom. These looms were set up ahead of time, as a I figured the younger kids would have trouble setting them up. If the children were 3rd grade and older, I would have them set up the looms themselves. 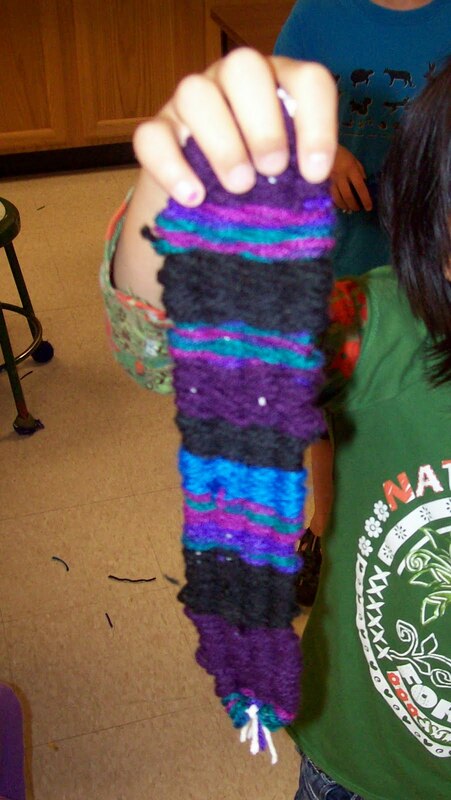 The campers chose a color of yarn and wove it straight across the loom (over, under, over, under). Because of the age of these campers, I had the students simply cut the yarn and only weave straight across. If the students were older, they could continue weaving the yarn back and forth. Suggest to the kids to choose a variety of colors and textures. I put out some colored wire, chenille stems, beads, feathers, ribbons and sticks. There are so many materials that can be incorporated into a weaving! Where to obtain yarn: I don't think I have paid full price for any yarn for s in the 5 years I have been at this particular school. Hit up yard sales, church garage sales, thrift stores, Craigslist.org and Yahoo Freecycle groups. You will be amazed at what people will give away for free. Send out notes to your parents that you are always looking for bright, colorful, textured and snazzy yarn. I found that if I don't ask for "fancy, textured or bright colored" yarn, I receive a whole bunch of faded, dusty, gross yarn. By best yarn has come from members of my knitting group. Since I knit in my free time and belong to a knitting group, I have told the members that I would be interested in any of their scrap yarns and leftover skeins for my school. I suppose you could find a knitting group online (such as a local group that has a Yahoo group) and put out feelers for yarn for your school. If you offered a small price, I'm sure some of the members would be happy to sell you their leftovers or even donate them. Welcome to Art is Basic. 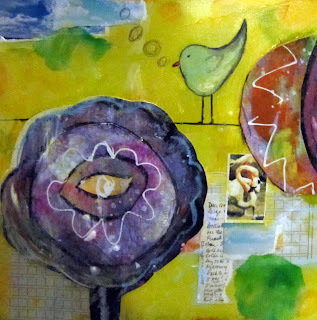 I am a K-6 art teacher in Madison, WI. I hope these lessons inspire you to try some artwork with your own children or will help you find new lessons for your classroom. 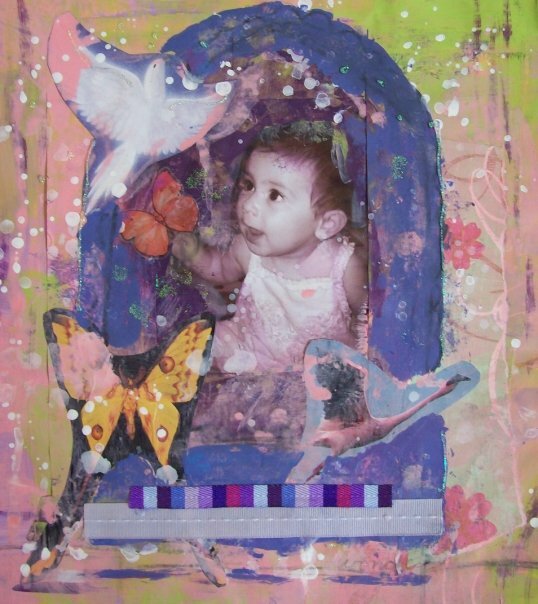 I believe that art is a basic part of a child's educational experience. Creative thinking should be a core objective in all schools. Art is a basic means of expression for people in all cultures throughout all of history. If you use any of these ideas and write about them, please link back to this blog. The images and text on this blog should not be used without permission. I recommend this drawing game! All images may not be used without permission.. Powered by Blogger.